Choosing the best diaper is difficult — make sure you identify all the features and identify the best diaper for your baby's needs. A good diaper keeps wetness away from baby’s skin helping to protect against irritation, rashes and chafing. A soft surface and stretchy sides gently protect baby’s delicate skin and comfortably adjusts to her shape. A line on the diaper that turns from yellow to blue letting you know when it may be time for a change. A cut-out on the front of the diaper that goes around the umbilical stump, keeping it dry and exposed to air to help it heal. 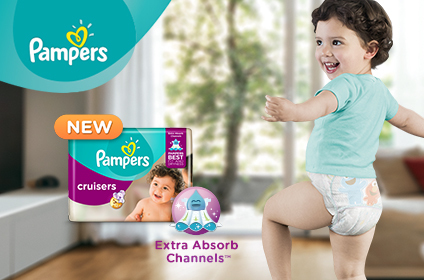 New Pampers® Cruisers® is the first and only diaper with Extra Absorb Channels™ especially designed to help distribute wetness evenly for less sag and up to 12 hours of protection. So your baby will have the freedom to move and groove in our best diaper. *Based on Size 4 vs. a leading value brand.